A tree toppled by Hurricane Maria rests in December 2017 on damaged tombs in the Villa Palmeras cemetery in San Juan, Puerto Rico. 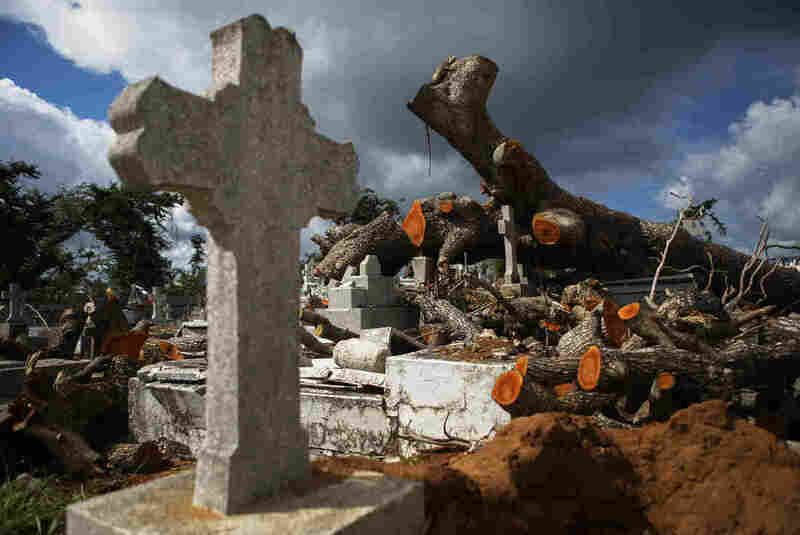 A tree fallen by Hurricane Maria rests in December 2017 on damaged tombs in the Villa Palmeras cemetery in San Juan, Puerto Rico. Around 5,000 people died in Puerto Rico in 2017 due to hurricane Maria in September, according to a study that dismisses the death toll of 64 as "substantially underestimated". A research team led by scientists from Harvard TH The Chan School of Public Health has not simply tried to count the dead in the wake of the mighty storm. Instead, they randomly survey selected households and asked residents about their experiences. From this they concluded that between September 20 and December 31, 2017, there were 4,645 "excessive deaths" – deaths – if the island had not been plunged into a prolonged disaster following the devastating storm. But the estimate is not as accurate as the number implied. The researchers expect a 95 percent probability that the death toll was somewhere between 800 and 8500 people. They say about 5,000 is a probable number. The findings are published Tuesday by New England Journal of Medicine. The research team randomly selected 3,299 households in Puerto Rico. Local scientists questioned them over the course of three weeks in January. People in these homes reported a total of 38 deaths. The scientists extrapolated this finding to the total population of the island of 3.4 million people to estimate the number of deaths. The researchers then subtracted the deaths registered in the same period in 2016 and concluded that the mortality rate in Puerto Rico had increased 62 percent in the three months following the storm. The mortality rate is a controversial issue, in part because federal and island governments have not responded to the disaster as quickly as in other hurricane emergencies. The study found that 83 percent of households in Puerto Rico were without electricity for the duration of their study, which lasted more than 100 days from the time of the hurricane until the end of 2017. Puerto Rican residents and outsiders observers have long argued that the official death toll is hopelessly inadequate. It records the number of deaths the forensic scientist attributed directly to the storm – the floods and howling winds that were the worst natural disaster in history for US territory. Maria came ashore as a Category 4 hurricane, with winds of more than 110 mph and rains. CNN has investigated funeral homes after the storm and counted 499 hurricane deaths. The New York Times compared official death certificates from September and October 2017 and identified more than 1,000 surplus deaths compared to the 2015 and 2016 average. A Penn State University researcher and colleague also used death certificates  The Government of Puerto Rico has commissioned scientists from the Public Health School of the Milken Institute of George Washington University to estimate excessive deaths. The results of this study have been delayed and will be published this summer. "Our approach is complementary to this and it offers a different kind of estimation and a different kind of insight into the effects of the hurricane," says Caroline Buckee, a lead author of the new study and epidemiologist at the Harvard TH Chan School of Public Health. The researchers suggested that the government in Puerto Rico could use their methods in an even larger survey to reduce the large uncertainties in their outcomes. The Harvard study covers a longer period than The New York Times calculations and this could be partly responsible for the much higher number. The Household Survey is a widely accepted method of estimating deaths following a disaster. The technique can be misleading if the sample is not truly random or if some households were completely wiped out and therefore absent in the survey – in which case the result would undervalue the actual burden. In fact, the Harvard team says its results are likely to be "underestimated" by this bias. The study looked at deaths by the end of 2017, but scientists speculate that the deaths were continuing this year. "We have seen consistent, high rates in September, October, November and December," says Rafael Irizarry, a biostatist in the research team. "There is no reason to believe that this trend will end on January 1st." "Hurricane Maria caused massive infrastructure damage in Puerto Rico," writes the Harvard team in his study. "In our study, the interruption of medical care was the main reason for persistently high mortality rates in the months following the hurricane," he wrote. Hospitals and doctors were struggling for care, and many people simply had difficulty getting to the doctor or hospital for medical treatment. The survey shows that one third of all deaths in the following months were caused by late or interrupted healthcare. Understanding the true number is important for many reasons. "There are implications not only for families, not just for closure, but also financial implications," as for help and preparedness, Dr. Satchit Balsari, a senior investigator who is a doctor at the Harvard FXB Center for Health and Human Rights. You can contact Richard Harris at rharris@npr.org .